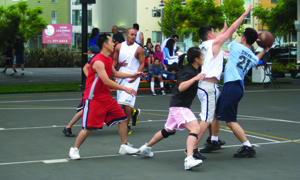 San Francisco benefits from California’s Mediterranean climate, characterized by mild wet winters and warm dry summers. While our summers are not always warm, they are dry. We suggest using the drought-tolerant and low-maintenance plants in this list to add color to your garden while still helping to conserve water. This list was provided by the Department of Public Works' Bureau of Urban Forestry. For more information about landscaping with drought-tolerant plants contact the Garden for the Environment. 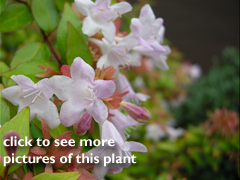 ABELIA- Abelias are family of shrubs native to eastern Asia and southern North America. The species from warm climates are evergreen, and colder climate species deciduous. Height - Abelias range in height from about 3 to 20 feet tall. Leaves - The leaves are glossy, dark green, and about one half inch long. The leaves turn purplish-bronze to red in autumn in the deciduous species. Flowers - White to pink, bell-shaped, scented flowers appear at stem ends. Flowering continues over a long and continuous late spring to fall period. *** - Heavy pruning encourages more flower growth. AGAPANTHUS - is native to South Africa. Height - The leaves will grow to about 2 feet, while the flowers grow on stalks about 3 feet tall. Leaves - The leaves are curved, green, belts, up to 2 feet long. 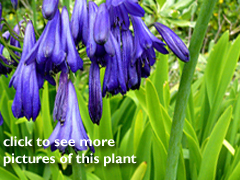 Flowers - Agapanthus have funnel-shaped flowers, in varying shades of blue or white. The flowers grow in bunches at the end of long stems. ALOE - is a family of about four hundred species of flowering succulent plants native to Africa. Height - Many species of Aloe grow at ground level; other varieties have stem with fleshy leaves. Choose your species carefully, some aloes grow to more than 9 feet high, while others don't grow more than 5 inches tall. 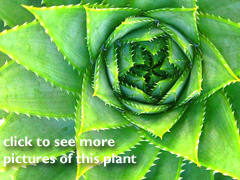 Leaves - Most aloes have a rosette of large, thick, fleshy leaves. The leaves are often blade-shaped with a sharp point and a spiny edge. Leaves vary in color from grey to bright green and are sometimes striped or mottled. Flowers - Aloe flowers are tubular, frequently yellow, orange or red and are borne on densely clustered, simple or branched leafless stems. CISTUS - are perennial shrubs found on dry or rocky soils throughout the Mediterranean region. 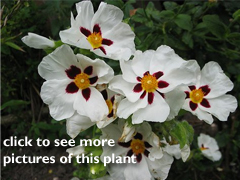 Height - Cistus vary in height from 3 feet to 9 feet, select a variety that suits your site. Leaves - The leaves are evergreen, usually slightly rough-surfaced, 1 to 4 inches long; in some species the leaves are fragrant. Flowers - Cistus have beautiful 5-petaled flowers ranging from white to purple and dark pink. Some species have flowers with a dark red spot at the base of each petal. Bees and butterflies are attracted to cistus. COTONEASTER -Cotoneaster is a genus of woody plants in the rose family Rosaceae, native to temperate Asia, Europe, North Africa. 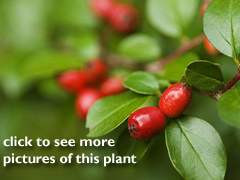 there are many species of cotoneaster - be sure to select the plant that best suits your site. Height - The majority of species are shrubs from 2 to 15 feet tall. Some are ground-hugging plants and others are small trees up to 50 feet tall. Leaves - The small, glossy, green leaves are arranged alternately. There are both evergreen and deciduous species of cotoneaster. Flowers - Cotoneaster is covered in creamy white to light pink flowers during late spring. The flowers mature to small red berries that cover the plant for a dramatic winter display. Cotoneaster species attract birds and butterflies. *** - Cotoneaster responds well to heavy pruning sending up many new shoots. It can be very difficult to remove an established plant. Take care when selecting your planting location. 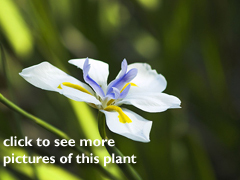 DIETES - Dietes is a family of plants related to the Iris. There are more than 4 species in this genus. Height - Dietes can grow to 4 or 5 feet under optimal conditions in moist soil or in water, and are usually about 3 feet in dry areas. Leaves - Leaves are narrow, sword-like and dark green and grow in large, grassy clumps. Flowers - Dietes have upright flower stalks bearing a succession of blooms usually lasting only one or two days over a long period of tim, with many 3 inch cream or white flowers; some with colored markings of yellow and violet or dark red. Dietes will bloom best in full sun. *** - Dietes can be an aggressive invasive, especially in moist soils. Take care to keep this plant contained. ECHIUM - Echium is a genus of 60 species of flowering plant realated to Borage, native to North Africa, Southern Africa, Europe, Madeira and the Canary Islands, as well as parts of East Asia. Species range from annual to biennial to perennial. Leaves - Leaves are gray or green and grow on a central stem. Most species are covered in small hairs that can irritate the skin. Flowers - Flowers grown on tall stalks. Flowers are purple with pink, rarely white. 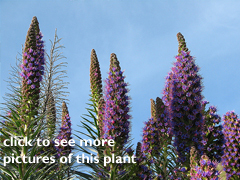 Echium species attract butterflies and bees. *** - Echium vulagare is a noxious weed, do not plant this invasive species of echium. All echium propagate readily from seed so please take care to keep this plant in a contained area. ESCALLONIA - genus of South American evergreen trees and shrubs comprising about 50 species. Height - Species range from 3 to 15 feet. Escallonia is fast grower. Leaves - Escallonia has shiny-leaves, small, round, evergreen leaves. Flowers - Escallonia summer bloomer with scattered, weak blooms throughout the year. The flowers occur in clusters of fragrant flowers in pink, white, peach or red. Escallonia is drought-tolerant when established, but flowers best with regular water. *** - Escallonia will grow from cuttings making it easy to propagate into a hedge. Be careful to properly dispose of trimmings to avoid unwanted plants. HEBE - Hebe is a genus of plants native to New Zealand. 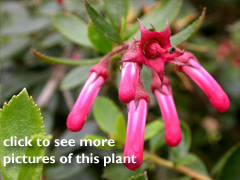 Height - Hebes range from 3 foot dwarf shrubs to small trees more than 200 feet tall. 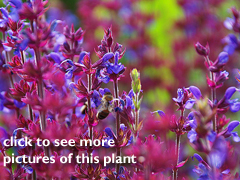 Identification of Hebe species is difficult, especially if they are not in flower, so be sure to select a species suited to your site. 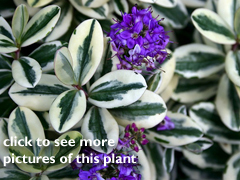 Leaves -Hebe has four perpendicular rows of leaves in opposite decussate pairs. Leaves are glossy dark green, gray or variegated. Flowers - Flowers grow in spiked clusters from thin stems. Hebes attract butterflies. Flowers are purple, lavender, pink, white. *** - Hebes can be propagated easily from cuttings. Be careful to properly dispose of trimmings to avoid unwanted plants. LAVENDER - Lavenders are a genus of about 25-30 species of flowering plants in the mint family, native to the Mediterranean region, Africa and India. Height - Lavenders range from 2 feet to 4 feet. Leaves - Fragrant leaves are small and green or gray. Flowers - Flowers grow on tall stems and range in color from purple to mauve to white. 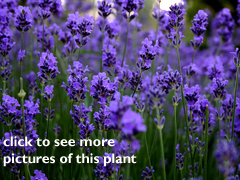 The most common species are: "Common" or "English lavender" (Lavandula angustifolia) which has green lobed leaves and small purple flowers at the end of leafless stalks; "Spanish lavender" (Lavandula stoechas) has grey lobed leaves and fat flowers with mauve bracts (look like petals) at the ends; "French" or "Spanish lavender" (Lavendula dentata) has gray fern-like leaves and flowers similar to Lavandula stoechas that are morepurple; and "French" or "French lace" (Lavandula multifida) has gray fern-like leaves and flowers similar to Lavandula stoechas that grow in clusters of three, like a trident. SALVIA- Salvia is a genus in the mint family. This genus includes shrubs, herbaceous perennials, and annuals. Be sure to select the species that is suitable to your location. Height - Salvias generally range from 6 inches to 4 feet. Leaves - Leaves grow in pairs in opposite rows along square stems. Flowers - Flowers vary in color and form. Colors range from white to red, yellow, pink, orange, purple, blue, even black. Salvias attract butterflies and bees. *** - Salvias are easy to propagate from cuttings in a glass of water. SEDUM- Sedum is a family of about 400 species of leaf succulents, found throughout the northern hemisphere, varying from annual groundcovers to shrubs. Leaves - The plants have water-storing leaves that come in many colors: gray, green, red, and blue. 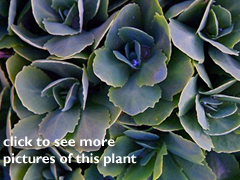 *** - Sedums readily grow from cuttings and are very easy to propagate as a groundcover.